With sirens wailing, a Beijing ambulance headed for the hospital was not rushing a patient back at all. It was returning from a noodle restaurant where staff members had dinner that night. It was Friday evening in Beijing and along Haidian Dong San Jie, an ambulance could be seen hurtling down the street – the vehicle's blue and red lights flashing and sirens wailing. The ambulance from the Beijing Emergency Medical Centre in Haidian was not rushing a sick or injured patient to the hospital, however. In fact, it was not carrying any patients at all. The ambulance crew was heading back from dinner at a nearby noodle restaurant. Onboard were other hospital staff, all dressed in their white medical coats. A netizen who claimed to be in the area snapped a photo of the ambulance as it returned to the hospital and reported the incident on his Sina Weibo account @BG2RHY. His post spread across social media, sparking debate over emergency-staff work ethics and non-compliance issues. As of Monday morning, the thread “should [drivers] give way to ambulances?” has been trending on weibo, racking up more than 7.8 million mentions and more than 3,300 shares. “So even doctors lack ethics and discipline now...this is sad,” wrote one user on weibo. The Haidian hospital acknowledged the incident and launched its own investigation. 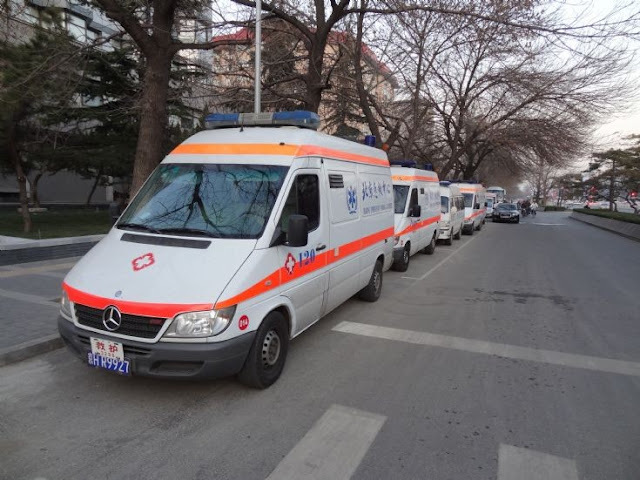 "Only in the case of an emergency would the use of a siren be permitted...ambulances are not 'privilege cars' and any private use would prompt investigation," one hospital official told the Beijing News on Sunday. The hospital announced its findings at a news conference on Monday and, on its official weibo account, said the ambulance crew would be handed the “appropriate punishments”. The Haidian hospital does not have a cafeteria, and staff members frequently went out to dine at nearby restaurants. Beijing’s emergency services have become the subject of much public attention recently, especially after a woman died in the back of an ambulance in early December, when a supposedly short three kilometre trip to the hospital took more than 40 minutes in the city’s manic rush hour traffic.